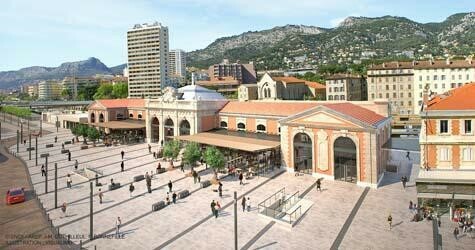 We will follow the line from Toulon towards St. Raphael, initially taking time to understand the rail and tram networks in Toulon. 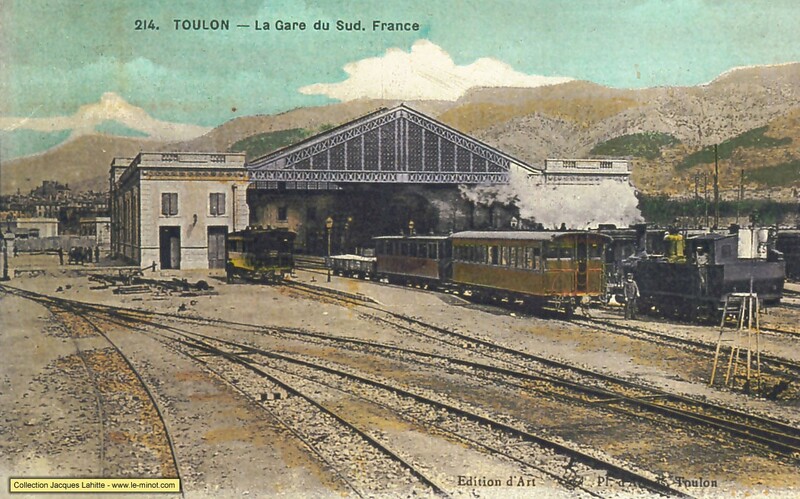 Toulon was not connected to the Chemin de Fer du Sud Littoral until sometime after the line opened. 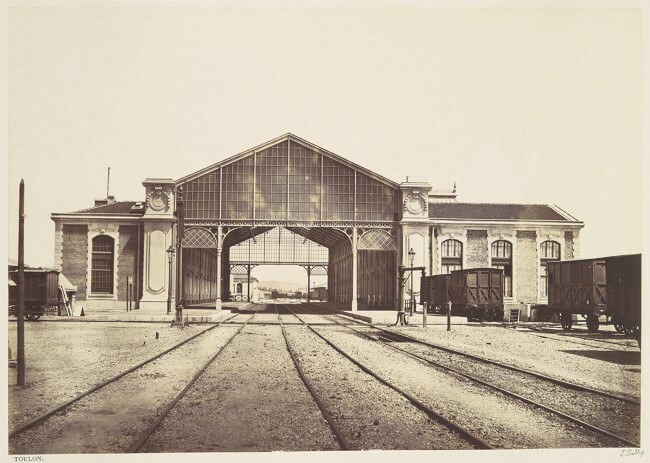 Objections were raised initially by the PLM, which, while it had supported the construction of the line from St. Raphael to Hyeres, was concerned about possible competition over the longer route and had provided its own link between Hyeres and Toulon. 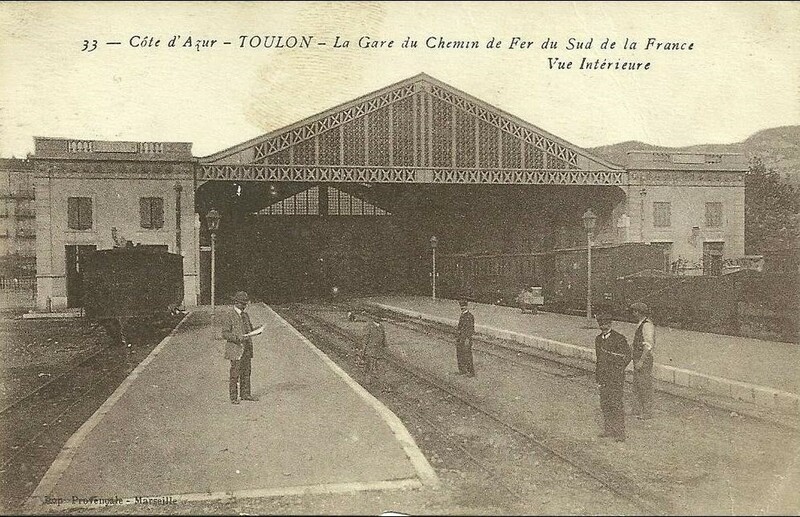 Demand grew for an extension to Toulon and a line was eventually opened in 1905. The featured image above is a Michelin map from the 1930s which comes from the website/blog of Marc Andre Dubout. The map below is an extract from the Western end of the featured image focussing on the city of Toulon. Apart from the obvious road detail on the map there are three features with noting. The first is the route we are going to follow which is shown in blue. The second, a fluorescent pink line, is the route of the PLM’s railway along the coast to Nice (which turns away north near La Crau and a branch from the PLM mainline to Hyeres and Les Salins-d’Hyeres. 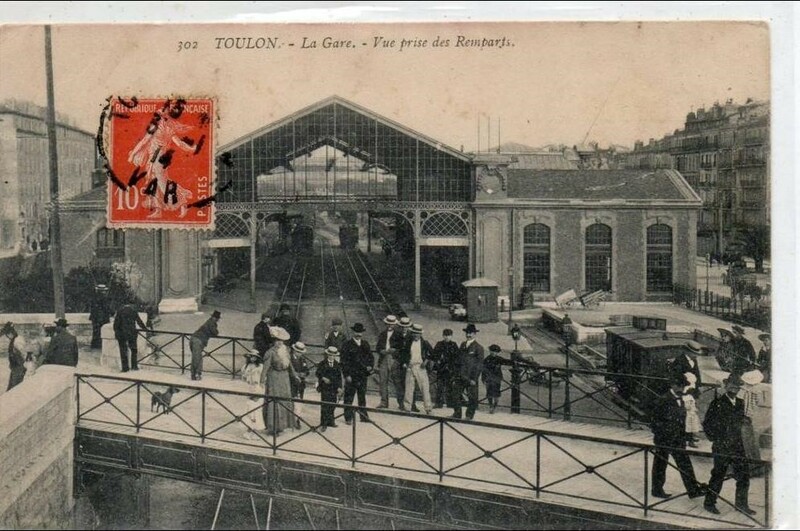 The third, in bright green, is the tramway from Toulon to Hyeres. 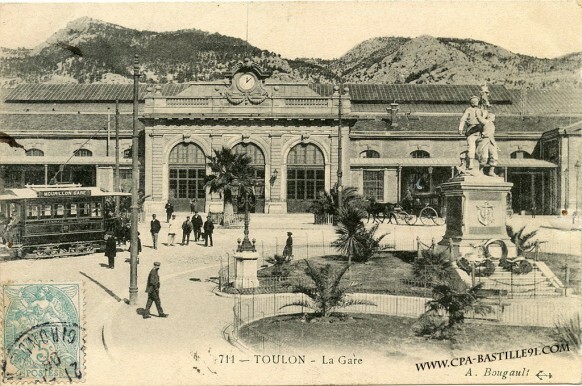 This is shown as a castellated line on the map alongside the GC129 or N87, and N98, extending West towards Toulon, and East towards Hyeres. 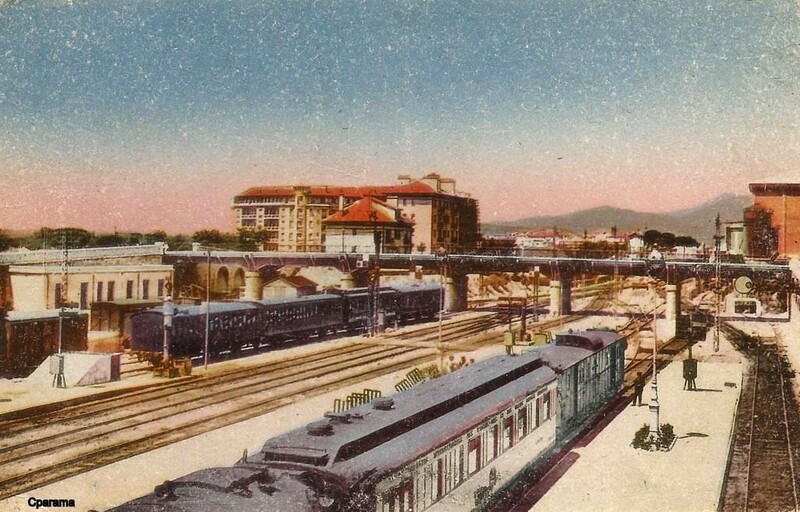 In different ways, at different times these four modes of transport were in competition or alliance with each other and with road transport as well. 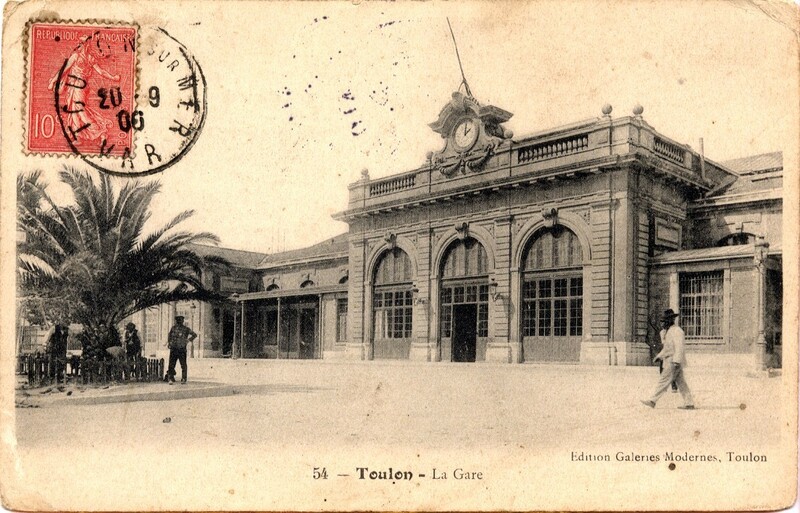 Toulon is a port city on southern France’s Mediterranean coast, lined with sandy beaches and shingle coves. It’s a significant naval base and the harbour is home to submarines and warships, as well as fishing boats and ferries. 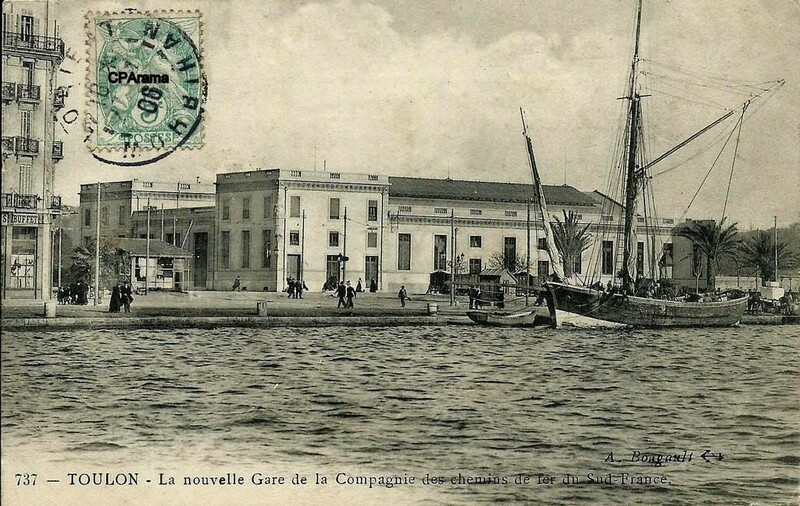 The grand Musée National de la Marine in the Port of Toulon exhibits maritime artefacts. Rugged limestone mountains form a backdrop to the city. 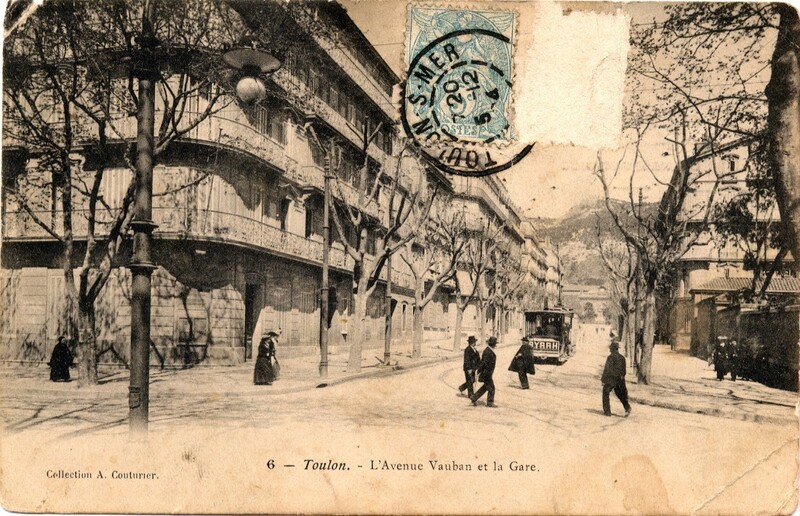 And a cable-car shuttles visitors up Mont Faron. 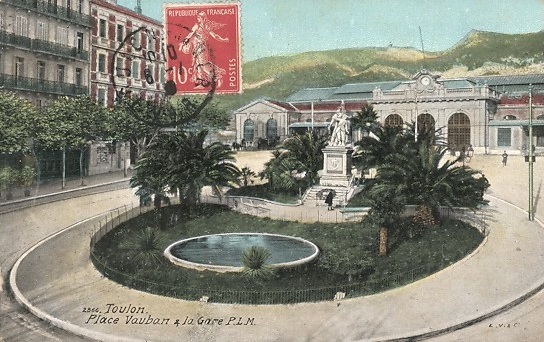 Toulon is the capital of the Department of the Var. 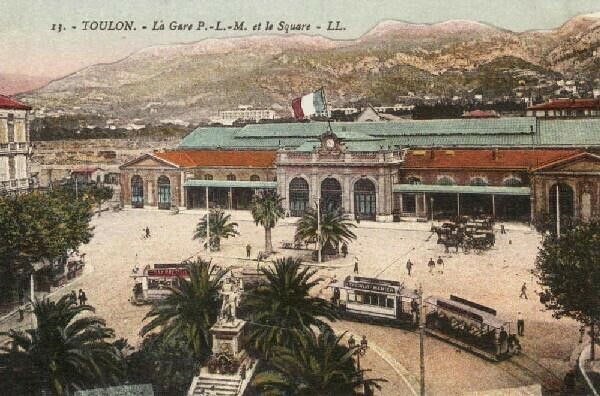 The Commune of Toulon had a population of about 165,000 in 2010 making it the fifteenth-largest city in France. It is the centre of an urban area with 559,421 inhabitants (2008), the ninth largest in France. 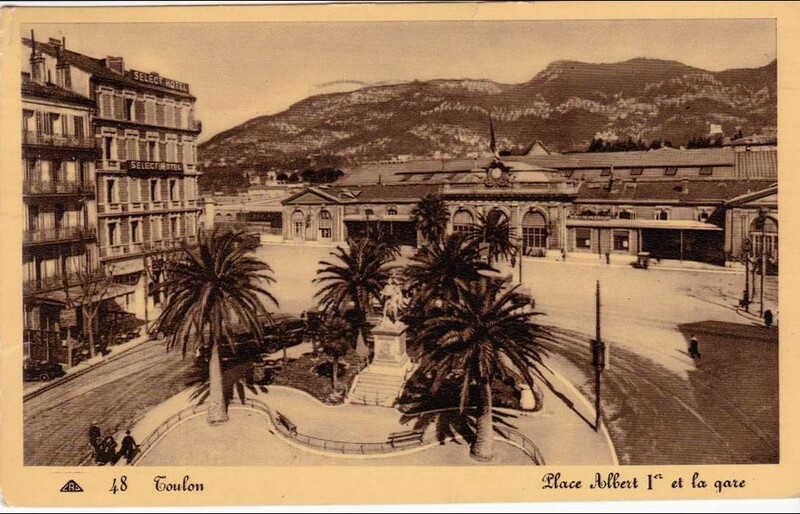 Toulon is the third-largest French city on the Mediterranean coast after Marseilles and Nice. 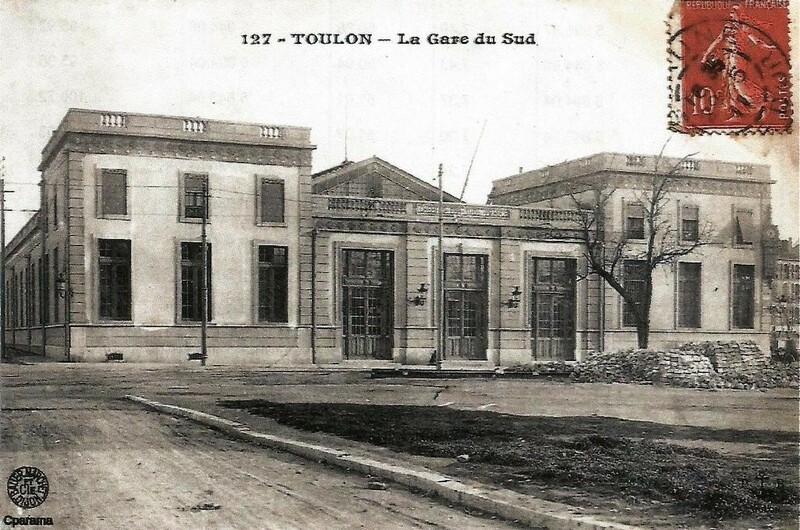 Toulon is an important centre for naval construction, fishing, wine making, and the manufacture of aeronautical equipment, armaments, maps, paper, tobacco, printing, shoes, and electronic equipment. The military port is the major naval centre on France’s Mediterranean coast, home of the French aircraft carrier Charles de Gaulle and her battle group. 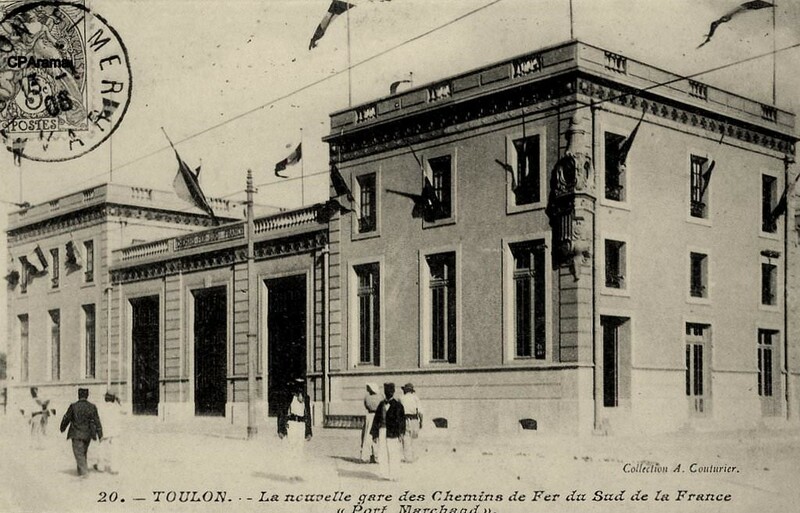 The French Mediterranean Fleet is also based in Toulon. 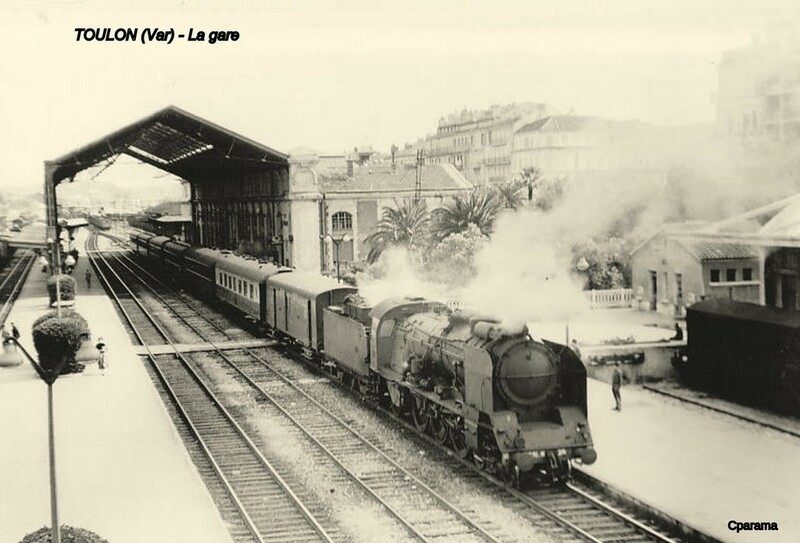 The PLM line from Marseilles to Nice via Toulon was completed in 1864, eighteen years after it first arrived in Marseilles and four years after Les Alpes Maritimes became part of France in 1860 and Nice became its capital. 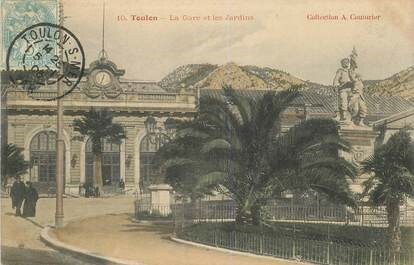 As a significant city in France, Toulon warranted a grand station. The PLM did not disappoint. This is what the station looks like today. 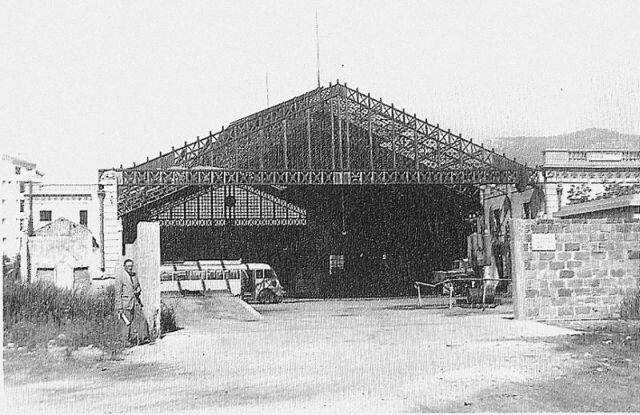 The original overall roof of the train-shed (see later pictures from the last century and 3D modelling drawings) has gone but the frontage and building remain. 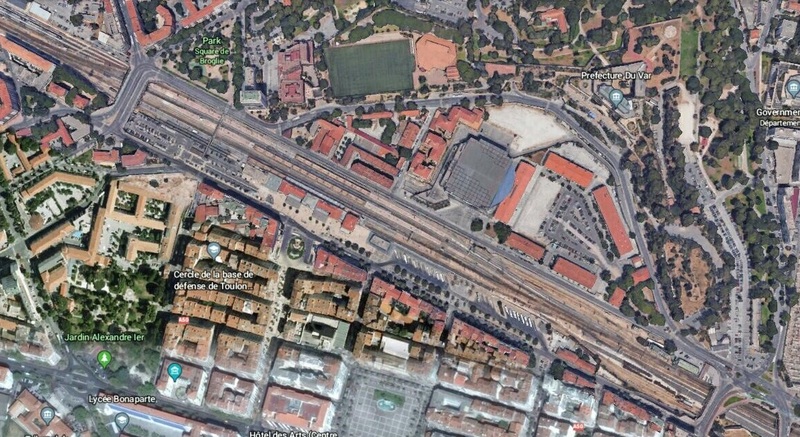 The satellite image below gives some idea of the extent of the passenger facilities and platforms. Sidings and goods facilities extend in either direction beyond the road bridges at each end of the platforms. The following images come from earlier times. 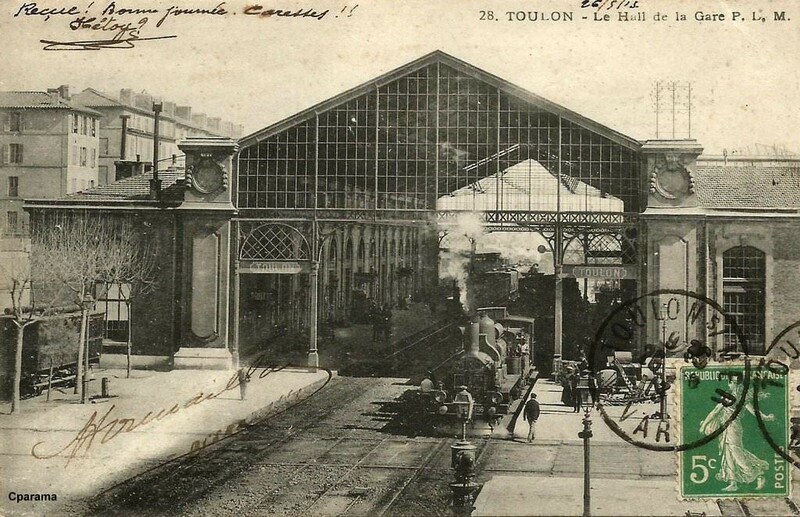 They show the station with its train-shed intact and some show the trams that served the station. 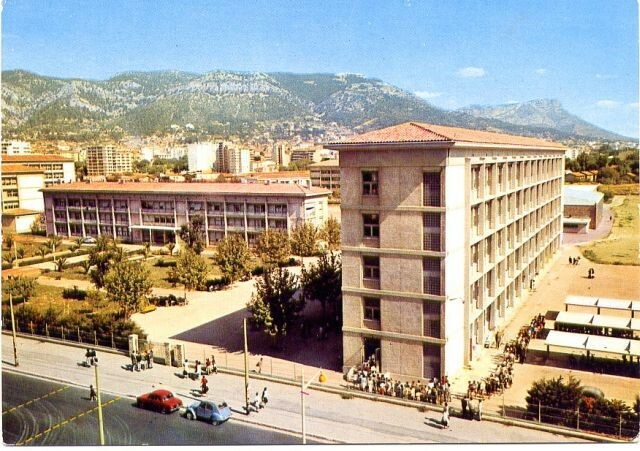 The photo below is of a 3D reconstruction of Toulon PLM as a CAD drawing. 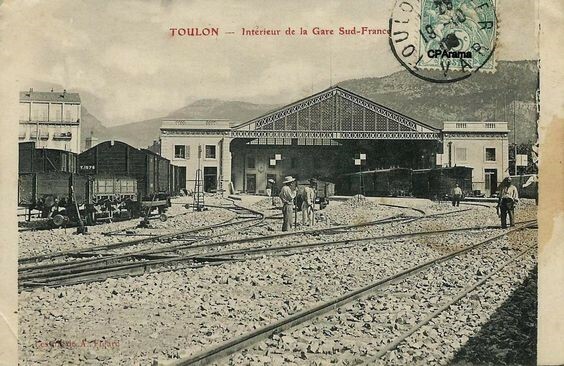 As we have already noted the Chemin de Fer du Sud arrived late in in Toulon. 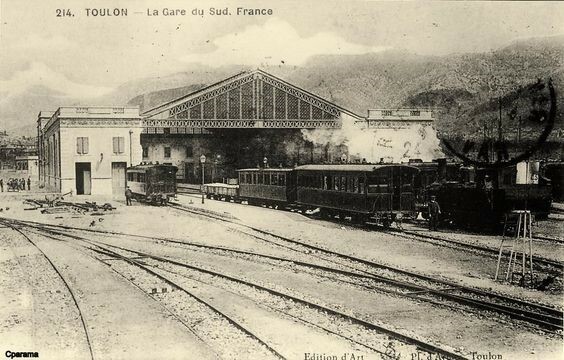 The first services were operating in 1905. 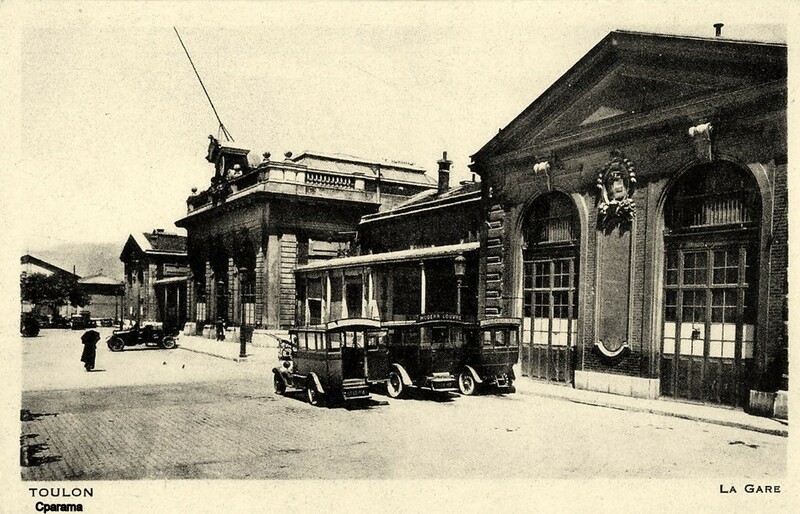 The station was also separated by some distance from the PLM station further north in the city. 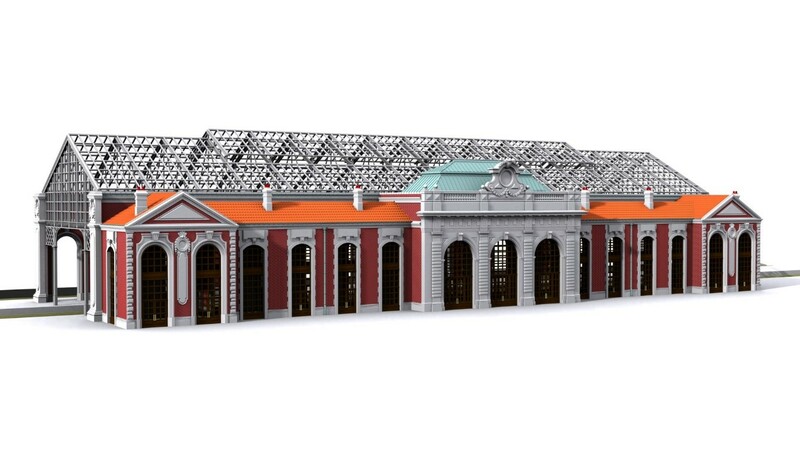 The images that appear next give an insight into the construction and layout of the station. The buildings, sadly, no longer exist and the site has been redeveloped. The first picture is of the opening ceremony. 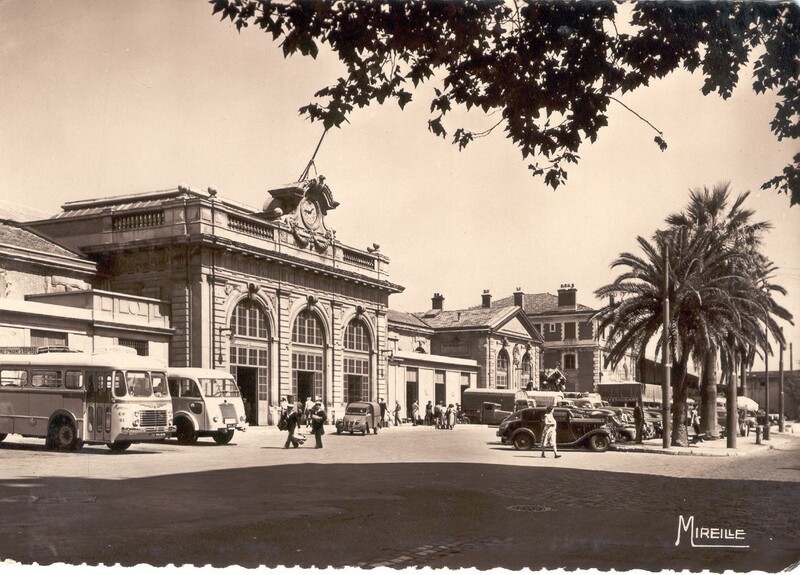 A large part of the Station was badly damaged in the bombing of 24th November 1943. The north wing got blown up and the glass roof lost almost all of its glazing. 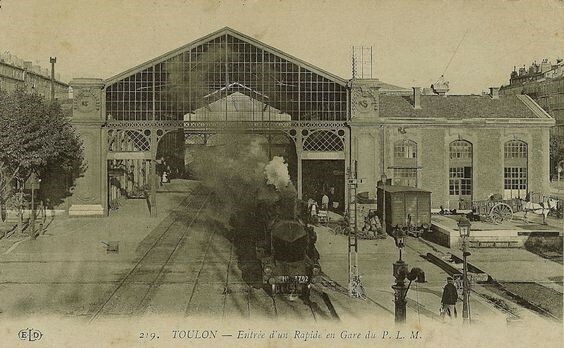 In the Spring of 1944 (29th April in particular) the station was hit again. 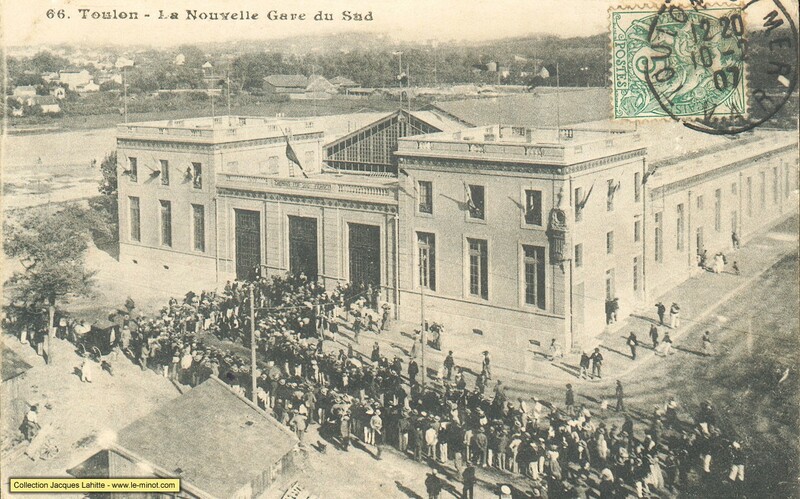 After liberation, the north wing was cleared and cordoned off with a palisade. Things remained like this until the line was closed. 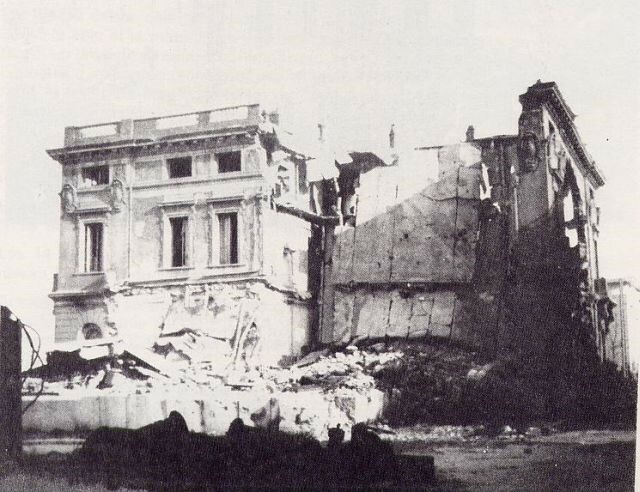 The bomb damage to the north wing. 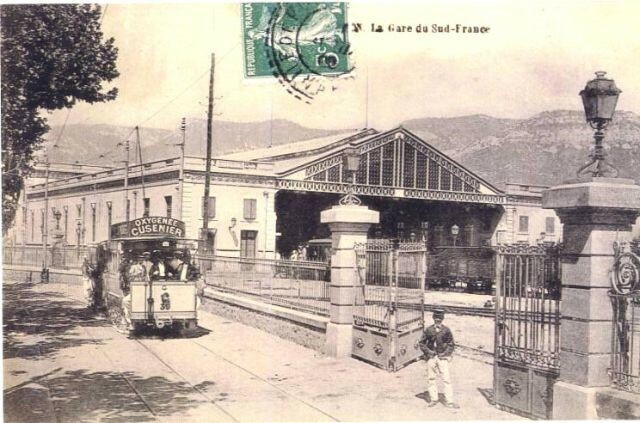 Beautiful old postcard of the early 20th century (around 1905) an overloaded tram carries its passengers towards the Mourillon. In front of the gateway to the South Station, a man in a boater poses patiently with his hands in his pockets. 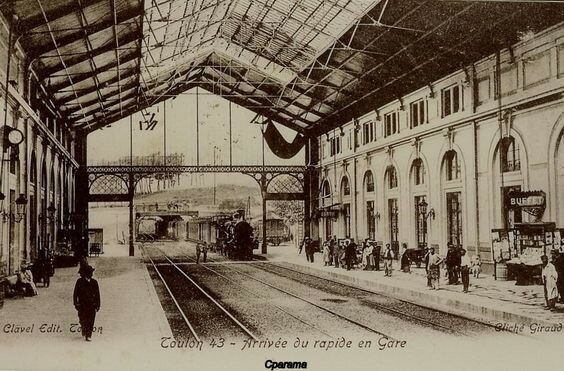 You can see behind it the vast buildings of the station (a “U” sheltered by a large glass roof which houses the tracks and platforms). 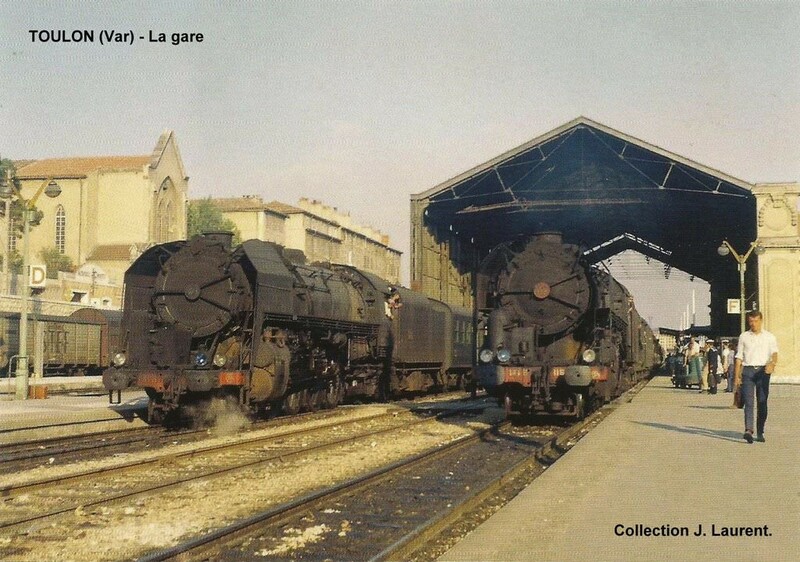 R. Le Corff; http://www.mes-annees-50.fr/Le_Macaron_gare_du_sud.htm, accessed 20th December 2017. 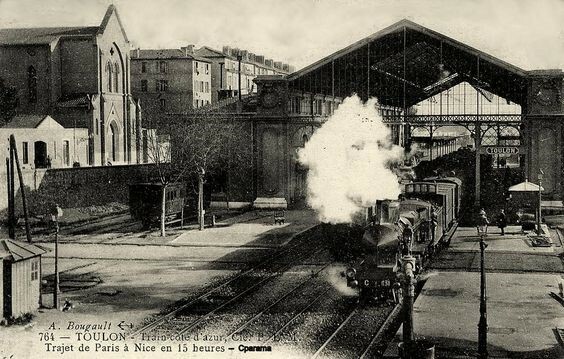 This entry was posted in Railways and Tramways Around Nice, Railways Blog on December 20, 2017 by rogerfarnworth.